Having multiple iTunes libraries on multiple computers can get pretty confusing. Not only have you purchased tracks on one PC or another, but often you've purchased them on a mobile device and synced or backed up that device to a single PC. 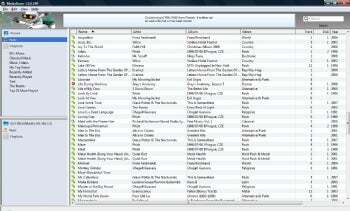 Wouldn't it be nice to have the same iTunes library, with the same tracks, on all your PCs? MediaRover is a completely free solution and it works well. MediaRover syncs all your music from each of your iTunes libraries; throughout your network, all tracks will be in all your libraries. Before you can get going with MediaRover, though, you need to set up file sharing. Start it on, say, your Public folder or a network drive, in Control Panel -> Network and Internet -> Network and Sharing Center. Password protect it if you feel that's necessary. Then, after you run the MediaRover wizard (and register for a free account; you'll want to do this as it's what allows you to share files between computers), it'll ask you for your Storage Server info. If you've set up a shared folder somewhere, click Locate Servers and it'll find the address of your network automatically. Then click Locate Shares, and it'll find all the folders you've set up sharing on for you to choose from. Put in the same password you just set up, then it's as simple as starting a sync. Initially, this sync copies all of your music files to the storage server. You have the option of also copying specific playlists, or all of them. (MediaRover sees only static playlists, not Smart or Genius playlists.) Then, these files on the storage server can be synced to any other PC. Next, install MediaRover on every other PC that needs to be synced, and put in the Access Code that MediaRover gave you when you registered, and the settings will carry over. There's no need to find the storage server a second time. Then, you'll be able to sync files on the other PCs, both from the PC to the server and from the server to the new PCs. Soon, all of your computers will have the same library. There is one caveat: MediaRover doesn't handle every duplicate exactly as it should. It does skip duplicate files when syncing from one place that has a specific file to another place that has the same specific file. But if a single location has two or more copies of the same track with different filenames, it won't skip them: it'll go ahead and sync both of them. It'd be nice if MediaRover could recognize identical tracks by something other than names only, and bypass those dupes as well. Bottom line is, MediaRover helps make your iTunes libraries make sense. Syncing files between all your media devices is important, because there's nothing worse than hunting for a specific track you know you purchased, or attempting to use iTunes' esoteric syncing rules to copy files between systems. Save yourself a headache and use MediaRover instead. Note: Registering for a free account on the MediaRover site unlocks its most important feature, the ability to share between PCs.